This is Mandy. 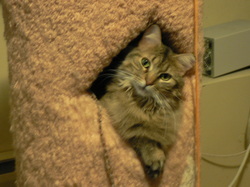 She was adopted on New Year's Day of 2012. She is 6 years old now. She lived in a feral colony of cats so took a while to get used to the house. 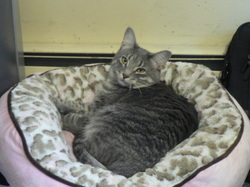 She is very sweet tempered, loving and playful. This is Flag. She is over 4 years old now. She was adopted from my friend Lee. Lee was feeding a stray cat outside her home but took her in when a big snowstorm was coming. The cat had 5 kittens and Flaggie was one of them. I gave her a new home. She is very playful and outgoing. This is Jolie. 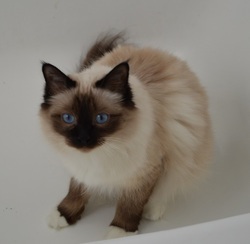 She is a Birman, my first pedigreed cat. She was born on 9/19/12 and I picked her up right after Christmas of 2012. She is very cute and playful. She can be sweet but also mischievous. She is very sociable with other cats and humans. Her fur always looks perfect!